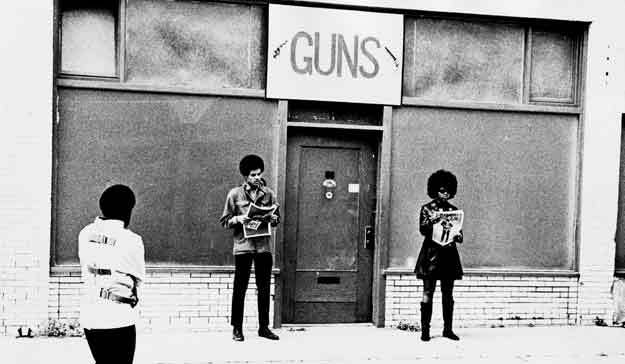 ore 16:00: Whitney Humanities Center, 53 Wall St.
Seize the time is a story of the Black Panther Party from an insider's perspective. Antonello Branca, a director who travelled in the United States to make documentaries for the Italian state television network, follows the militants of the party in their daily activities. Norman Jacobs, the only professional actor, moves between symbolic visions of imperialism, student demonstrations, national guard drills, and direct testimonies. The film's title is taken from a song by Elaine Brown, former chair of the BPP, who participated in the film. Discussion post-screening with Elaine Brown (via Skype). 4 pm, Friday September 27th, Whitney Humanities Center. Sponsored by Film Studies, Films at the Whitney and the Department of Italian. A "cult" film of the 70s about the Black Panther movement, it was made in the United States following the work of the Black Panther Party from within. The title was inspired by the homonymous song by Elaine Brown who participated in the film. Antonello Branca constructs a narrative framework skillfully bringing together the canons of fiction cinema and documentary cinema. Only one professional actor, Norman Jacobs, who moves between pop-symbolic visions of imperialism to stars and stripes set against reality: area searches, student demonstrations, national guard drills, direct testimonies. An America where the black, and the "panthers" in particular, are assassinated in cold blood according to a precise repressive design. In the book: original unpublished photographs and comments by Nobuko Miyamoto, Antonello Branca, Italo Moscati and Elaine Brown. The Dvd also contains What's Happening?, an irreverent portrait of America of the 60s seen through the experiences of artists of the Beat Generation and Pop Art. The America of the Vietnam war, ploughed by contradictions and explosive social tensions but potentially saturated with expectations for the future. With: Andy Warhol, Allen Ginsberg, Roy Lichtenstein, Robert Rauschenberg, Gregory Corso, Fred Mogubgub, Marie Benois and Leon Kraushar. Seize the Time (Italy, 1973) 93 min.